The bounce in the US stock market arrived on Monday after trade wars fears began to dissipate following steps taken by China that negotiation was on the table. The US benchmarks had their best day in nearly 18 months with the Dow Jones and S&P500 climbing 2.84% and 2.72% respectively whilst the Nasdaq surged 3.26%. Facebook was a notable absentee from the rally. The VIX lost 15.4% to close at 21, while the Dollar Index lost ground and oil and precious metals were both bid for. Gold climbed above $1350 with silver close to 1%. 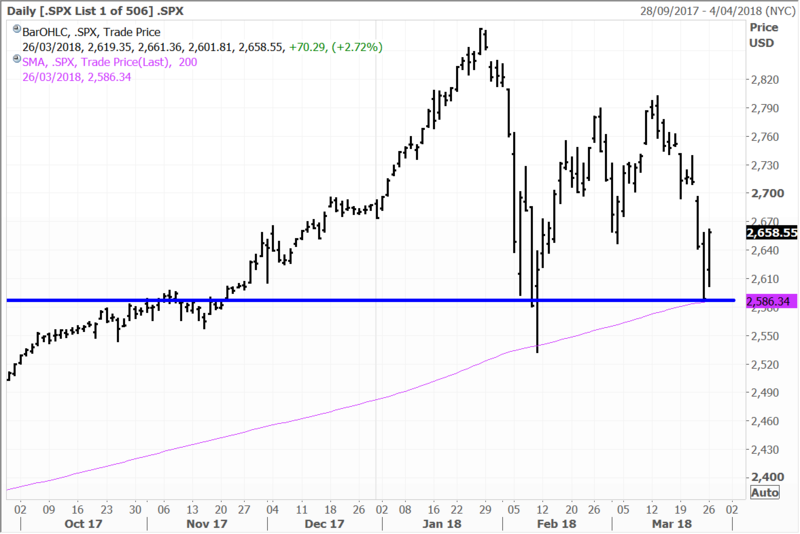 The S&P500 convincingly bounced off the 200-day moving average and key support at 2,580 to post a reversal. Whilst new record highs above 2,800 are unlikely in the very near term, I think the market will take its lead and direction from the upcoming reporting round which will set the stage for the next 3 months. This could very much be a situation in four weeks’ time where investors look back and see the ‘correction’ as having arrived early this year. Indications by the Trump administration that it was prepared to negotiate was reinforced by Treasury Secretary Steven Mnuchin telling Fox News that he’s “cautiously hopeful” that China will reach a deal to avoid tariffs on $50 billion of US exports, while European leaders demanded a permanent exclusion at the threat of retaliation and a deal was struck with South Korea. Chinese Premier Li Keqiang said on that China and the United States “should maintain negotiations” and he reiterated pledges to ease access for American businesses, in a clear sign yet that Beijing is seeking to avert a trade war. Li speaking at a conference said that “China would treat foreign and domestic firms equally, would not force foreign firms to transfer technology and would strengthen intellectual property rights. With regard to trade imbalances, China and the United States should adopt a pragmatic and rational attitude, promote balancing through expansion of trade, and stick to negotiations to resolve differences and friction”. I wrote yesterday that this is a pattern we have seen before with the Trump Administration, with the latest trade war fears that have spooked the markets being an apparent replay of the dynamic we saw with North Korea last year. The Trump Administration maybe many things, but I don’t see it as being antibusiness, in fact quite the opposite. The recurring pattern of “shock and awe” statements emanating from the White House seemingly quickly gives way to a “style of negotiation”. Many lobbyists and diplomats are becoming less reactive to this, and we saw this on display with China’s relatively subdued response. However, it was these trade tensions that were at the centre of last week’s global equities selloff – the biggest since February. It therefore stands to reason that the markets will firm this week as tensions recede, and with focus now about to turn to the upcoming reporting season for the March quarter – which is due to commence in a couple of weeks’ time. With economic data being still quite robust, the US corporate sector should come through with another solid round of profit results that will give less for the markets to worry about for now. Investors will once again turn to earnings and the fact that the indices and company valuations are more compellingly priced than during the last round of reporting back in January. There can be no denying that a certain amount of technical damage in the past two months has shaken confidence and this will take some time to return. The correction, which occurred early this year, has been relentless and severe over the past 8 weeks since the early Feb volatility spike. 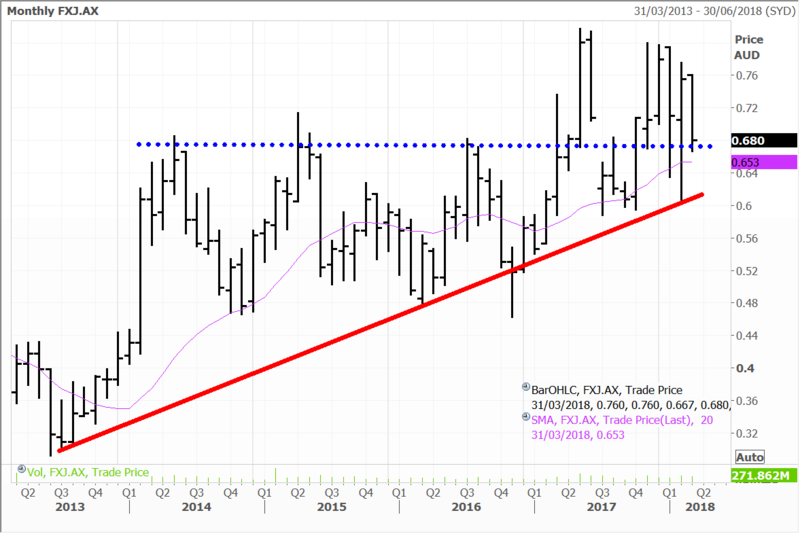 Confidence will return however with US and global economic conditions the best in many years and as the corporate sector allay fears by reporting solid profits over the next 6 to 8 weeks. Just as the correction seemingly arrived out of nowhere in eight weeks ago, I think sentiment could quickly turn and dissipate if the US and global reporting season delivers on consensus forecasts and growth. On that note Morgan Stanley strategists reiterated their target of 3,000 for the S&P500 last week – which was 20% higher than the benchmark at the time. I think on balance today, with valuations much more compelling, trade war fears overstated by the markets, not to mention a significant amount of deleveraging by investors since February and an upcoming reporting season for the March quarter that is likely to deliver, the balance of risk lays to the upside for now at this juncture. The juncture facing the market at the moment reminds me a lot of what Warren Buffett once said that “people tend to get scared out of stocks”. And that is precisely what we have seen over the past 8 weeks with the catalysts of spiking volatility, rising bond yields and trade war fears pushing many out of the market from sheer fear that the good times were over. This has been apparent not just in the US but around the globe – and particularly so in Japan. Much of the selling last week was fairly indiscriminate with Friday lacking any real catalyst. Fundamental drivers therefore look set to make a “return” as focus once again shifts back to the corporate sector after the Easter break. Apple shares were up 4.75%, Cisco had advanced 3.87% and Chinese online search giant Baidu was in the green to the tune of 2.55%. Homebuilders were gaining with D.R. Horton up 3.19% and Lennar tacking on 1.98%. Walt Disney shares were up 2.1% and casino operator Wynn Resorts had ticked up 0.64%, while online real estate portal Zillow was gaining 2.78%. Logistics titan FedEx was ahead by 4.5% and gold miner Barrick Gold was up 2.08%. European stocks started out of the gates in positive territory on Monday and spent most of the trading day above water but slipped into negative territory by the close. The pan-European Stoxx 600 was down 0.72% for the day, with the Euro Stoxx 50 index of eurozone blue-chip stocks sliding 0.6%. Banks across the region generally traded modestly lower, with the likes of Bankia down 0.5%, BNP Paribas slipping 0.6% and Credit Agricole just 0.2% lower. Caixabank held up relatively well, flattish at 0.05%. Asian stocks were mixed in trading Monday. Japanese equities recovered from lows early in the trading day to finish 0.72% higher. With the fiscal year ending 31 March for most Japanese companies some buyers were likely snapping up stocks before they go ex-dividend. Around $60 billion in dividends could be reinvested back into the market over the next few weeks. Exporters generally showed a recovery as the yen slipped a bit against the greenback (US$), with air conditioning giant Daikin Industries up 2.2%, while robotics leader Fanuc also gained 2.2%. Truck maker Hino Motors added 1.1%, touch screen technology expert Nissha Co advanced 1.4% and video game developer and publisher Square Enix tacked on 1.3%. Energy company Inpex rose 2.3%, while the megabanks Mizuho, Mitsubishi UFJ and Sumitomo were mixed, with ranging from minus 0.1% to positive 0.4% for the day. In Hong Kong, oil and gas super-major CNOOC gained 2.1%, and social media giant Tencent Holdings shares recouped some of the recent correction, adding 1.6%. The Macau casino operators MGM China, Sands China and Wynn Macau all advanced between 0.6% to 1.5%. CNOOC, MGM, Sands and Wynn Macau are held in the Global Contrarian Fund. Tencent is a holding in the managed account portfolios. We still like Fairfax Media and we continue to hold the stock in the Global Contrarian Fund, as well as the managed account portfolios. The company’s 60% stake in Domain is one key attraction, and I have outlined the growth opportunities that we believe exists for the property portal as it gains ground on larger competitor REA. It is also not just about Domain, and there remains significant unlocked value in Fairfax’s more traditional media assets. This was borne out by the company’s half year numbers, which in addition to further cost reductions, solid progress is being made on the digital front. Subscriptions to Fairfax’s key masthead brands saw the biggest uplift in four years. In addition to metro, regional media also remains alive and well. On that note there was an interesting article in the AFR today which suggested that Fairfax (or parts thereof) may come back under the gaze of private equity. The article stated that “Anchorage Capital Partners has signalled its interest in regional publishing and is known to be keeping a watching brief on News Corporation’s and Fairfax Media’s regional assets.” While firm discussions have not been had ‘sources’ have evidently said “it would be logical for Anchorage to …add on Fairfax’s Australian Community Media” after moving for News Corp’s regional business. I certainly wouldn’t be surprised given that the businesses were evidently in the frame a year ago, when private equity was looking to carve up Fairfax and maintain the main mastheads. The businesses have turned around further since then and would command a higher price, particularly now as the costly restructuring phase is mainly complete. India’s ICICI Bank saw a disappointing net 88% uptake in the IPO of its securities business which is being spun off. The ICICI Securities IPO raised US$540 after a three-day book running process. The Bank is selling down a 24% stake in ICICI Securities. The IPO was expected to raise as much as US$620 million. The financial services provided by ICICI Securities which is the largest brokerage in India include, institutional and retail broking, investment/merchant banking, financial product distribution and advisory services to corporates, retail investors and financial institutions. 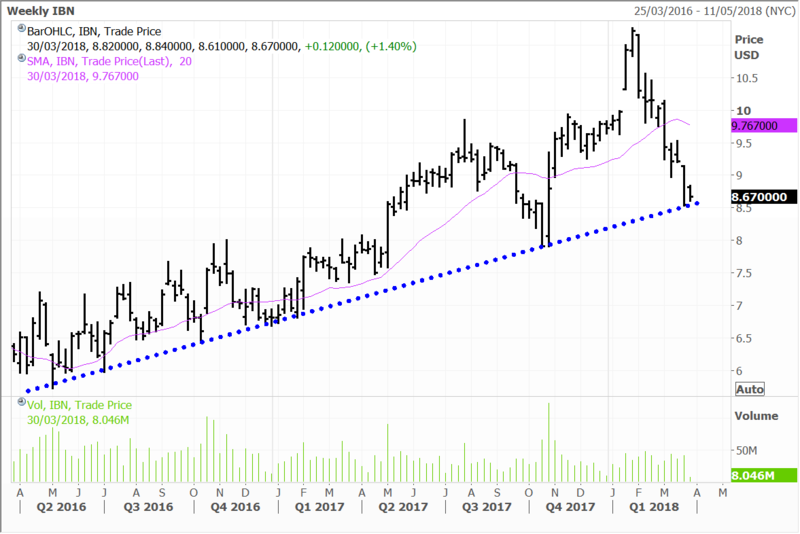 ICICI Bank is a holding in the Global Contrarian Fund and in the Global Opportunities managed account portfolio. I remain bullish on India’s banks particularly as the Indian government is assisting in restructuring the sectors nonperforming loan book which has held back lending growth. India’s economy has the one of the highest growth rates in the world and is rolling out key infrastructure such as a 5G platform that will maintain the trajectory. Disclaimer: The Fat Prophets Global Contrarian Fund declares a holding in Baidu, Disney, Bankia, Caixabank, Fanuc, Inpex, Hino Motors, Nissha Printing, Mizuho Financial, Mitsubishi UFJ, Sumitomo Mitsui, Fairfax, Domain, MGM China, Sands China, Wynn Macau, CNOCC and ICICI.